I needed a ‘palate cleanser’ between a couple of big makes. Something that was uncomplicated, casual and suited to fabric that I wouldn’t cry about if failure hit. 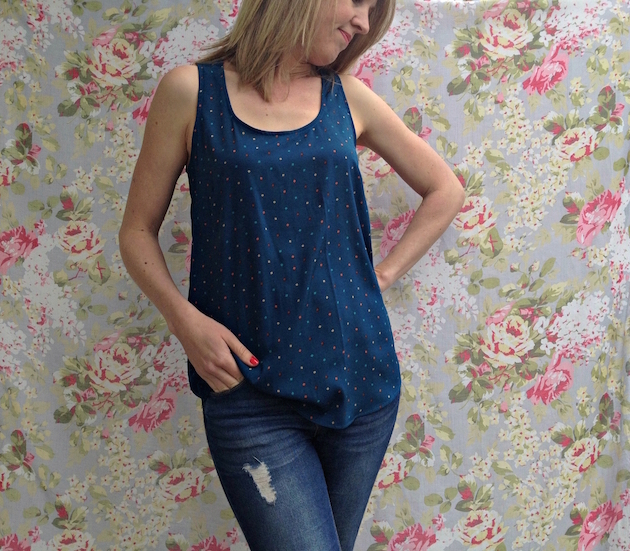 This is the Ella Top by Liola Patterns, which is available via Indiesew. I made it using this (static-prone) polyester fabric which I found for $3 per metre over a year ago. With the pattern, I was initially dubious about the suggested size. There appeared to be a lot of ease, but I trucked on anyway, making a size M and the fit turned out perfect. No alterations needed. Hooray! 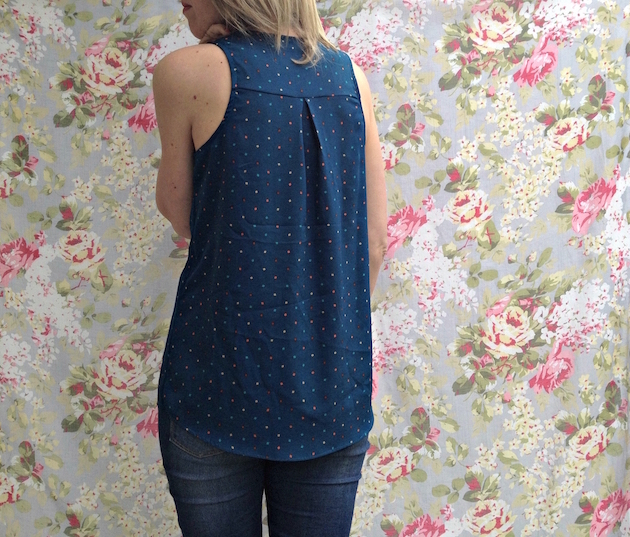 The top features a cute back yoke and pleat, with a slight racerback shape. I did steer away from the instructions a little to enclose the shoulder seams within the yoke pieces. Also, rather than enclose the bias ends within the seams, I stitched (once the rest of the bias piece was attached) the ends together and sewed it flat. But otherwise, there’s nothing fancy involved and the instructions seemed well written. This was a fun make and is probably a good one for beginners too. The bias edges are certainly a handy skill to have. 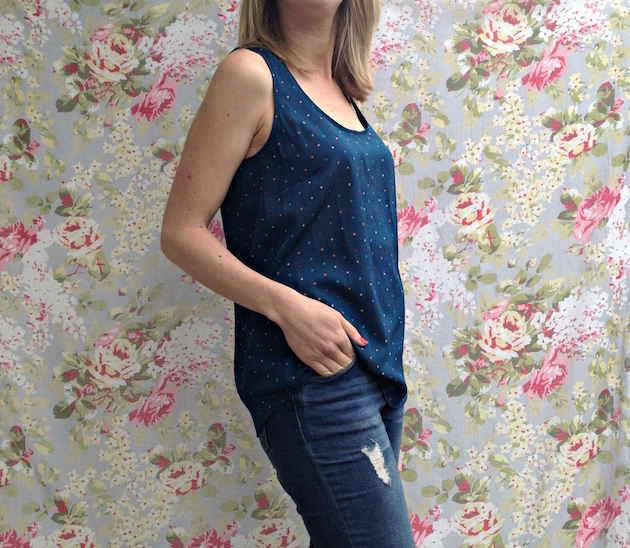 It’s a fuss free project and just what I needed to keep the sew-jo on track. Oh this is cute, I love the back detail. I’ll have to look out for this pattern. I like the back too. There is room for some pattern play on that yoke too. I only discovered Indiesew last week and there’s a few designers there I haven’t heard of before. It’s always nice finding a fresh avenue to feed the addiction! Love the top, especially the pleat at the back. I just bought some anti static spray for those clingy garments. It seems to work well. Good thinking. I currently put water on my hands and dampen down the sides. I might have to look out for some spray! This looks lovely, I really like the slight, but not too extreme, racer back. It gives a nice shape without having too worry about bra staps showing! I like the idea of a palate cleanser, just what I need after sewing my first blazer. Yeah it’s very cute. I think the back is great. Here’s to palate cleansers! 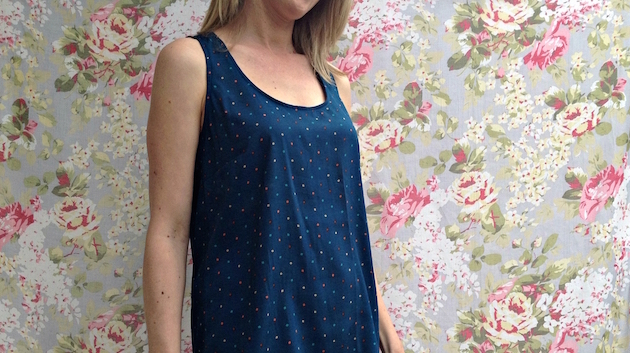 I love the top and the fabric you used! It looks so light and comfy, I bet it can easily be used to be worn by itself or to layer underneath a nice leather jacket. Thanks Kayla! Yes, it’s a very wearable top. I think this has become my go-to tank top pattern now. very nice fit. i must check out this pattern company. Thank you, Carol. It’s always fun finding new patterns and companies. I just found IndieSew and The Ella pattern. Your top is really cute. Have you made this pattern again ?